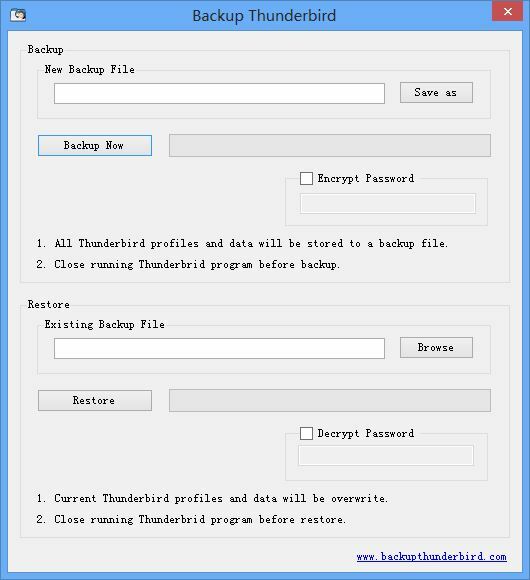 A free Thunderbird backup utility. 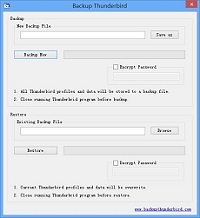 Backup Thunderbird is a free Thunderbird backup utility for Windows. It enables you to quickly backup and restore all of your Mozilla Thunderbird E-Mail Messages, Newgroups, RSS Feeds, Address Books, E-Mail Accounts and all other options. Just a couple of mouse clicks - no need for any professional knowledge. You can easily backup all your E-mail client data. If you use Thunderbird on Windows, this is the software for you! Freeware, download from a mirror. All Thunderbird e-mail client profiles and data will be stored to a backup file. Select a new backup filename using the "Save As" button, then click the "Backup Now" button to start. Please note that you need to close Thunderbird before performing backup. First, make sure Thunderbird is not running. In the "Restore" groupbox, select an existing backup file, then click the "Restore" button. All Thunderbird profiles and data will be overwritten. So that you can protect your e-mail messages and all your other personal information, this software provides an encryption function. Before you perform a backup, you can set up an encryption password, so the resulting backup file will be encrypted. Accordingly, when restoring your encrypted backup files, you will need to provide the correct password. Copyright © www.backupthunderbird.com, all rights reserved. Mozilla and Thunderbird are trademarks of The Mozilla Foundation.